Scanning probe microcopies allow measuring fluctuations of surface heights. 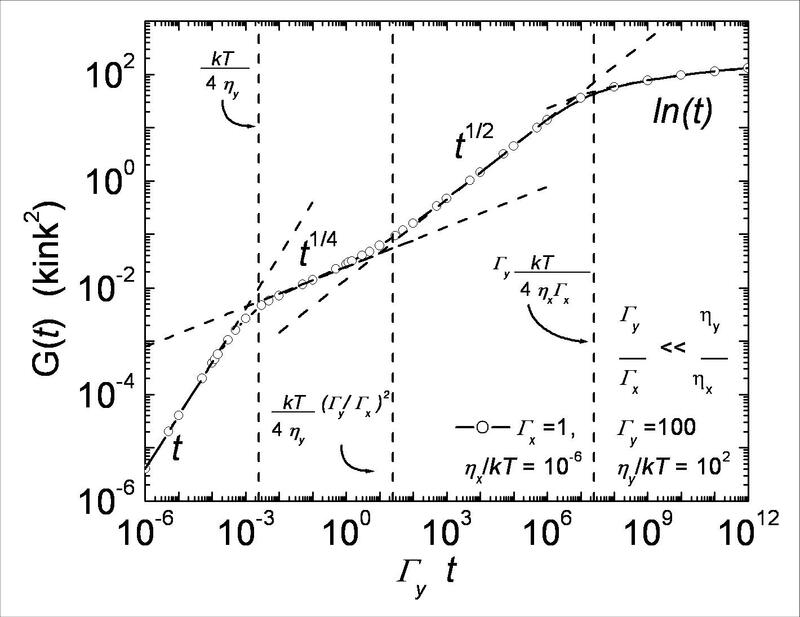 Correlation functions G(r) versus time (at one fixed point r) or space-time (across an entire image) can thus be measured at thermal equilibrium. What behavior can be expected? How to interpret them, beyond the very first 1-d approaches (90's)? What is universal, and what depends on the microscopic parameters? where is the anisotropic Laplacian , the rate constants for diffusion (related to elementary activation energies for diffusion) and (ηx, ηy) the surface tensions (related to the kink energy and step-step interaction constant, Calogero-Sutherland model). V(h) is a localization potential favoring integral value of the surface heights for temperatures T below the roughening temperature TR. Fig.2: Identification of the various G(t) regimes versus temperature T or step-step distance L (i.e. versus surface anisotropy). Hatched area: time range for STM measurements. Parameters for vicinals of Cu(111) (Ek=1310 K, A=71 K. Left: L= 21.6 u0, right: T=505 K.
The Langevin equation so-defined belongs to the university class for conserved dynamics and conserved noise. Simple scaling arguments give for , and , with: α=0, β=0 and z=4 (in the present context, 0 exponent means saturation (T<TR) or logarithmic divergence). It is found (Fig.1) that for anisotropic surfaces (like vicinals) extended intermediate , and t1/2 regimes becomes possible between the initial linear variation (no correlation) and the long time logarithmic one, in agreement with experimental observations. Extensions of the various regimes (Fig.2) together with approximate analytical solutions within each of them are given. These results allowed the interpretation of measured space-time correlation functions of surface heights at thermal equilibrium. 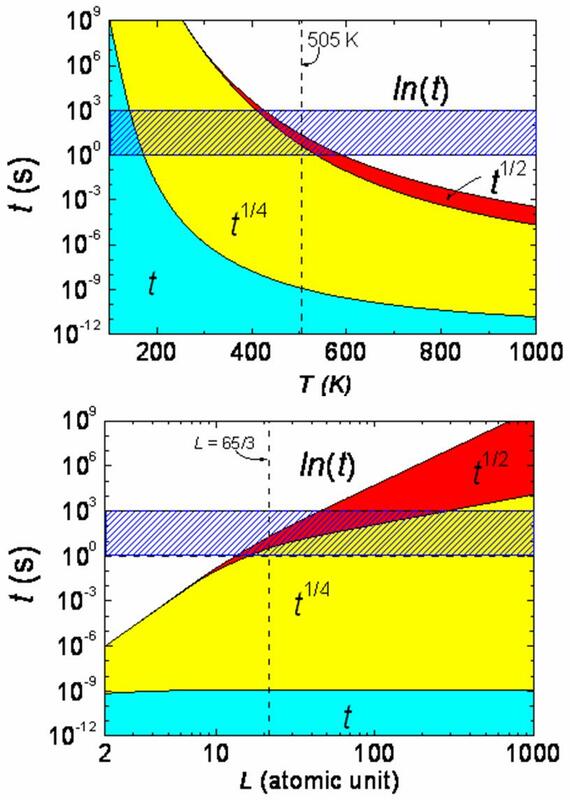 Measurements of surface tensions and diffusion rate constants follow and thus of atomic parameters. REFERENCE: L. Barbier, E. Le Goff and B. Salanon, Surface Science 531(3) (2003) 337 and reference therein.